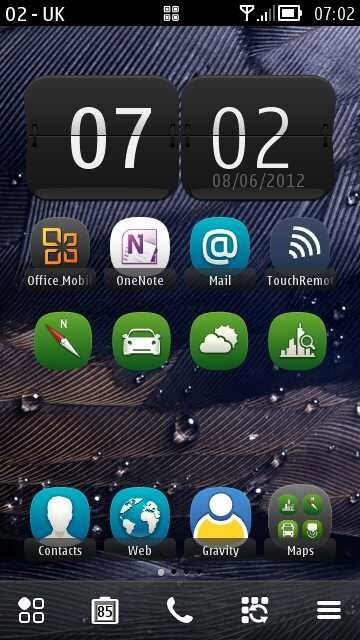 Have you ever noticed the wide spacing in the bottom button bar on your Nokia Belle device when on the home screen in the menus? 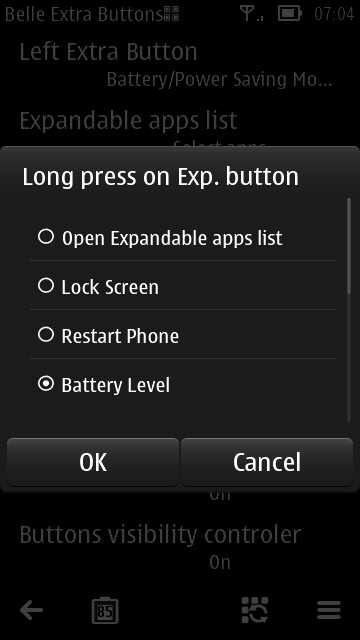 1) Lock/Restart – tap/short press provides an on screen alternative to the standard screen lock method, whilst a long press will restart the phone. 2) Battery/Power Saving Mode – tap/short press brings up a a battery level informational window whilst a long press toggles “Power Saving Mode” on and off. A nice little touch on this button is that the battery level percentage is written across it. 3) Task Switcher/Close open apps – tap/short press provides an on screen alternative to the standard method of opening the Task Manager, whilst a long press closes all open applications that would be displayed in the Task Manager. Although the concept of Belle Extra Buttons was nice, for me it needed more button functionality for it to become a staple on my Nokia Belle device, however the main function that made me keep the app installed was the one touch reset capability. Since then, Mr Alshahawy has been hard at work expanding and improving functionality of Belle Extra Buttons to add “Expandable Apps Lists” providing a 12 app list pop-up window taking you from two buttons to a theoretical maximum of 26 buttons. The next update changed the “Expandable Apps List” icons and gave them secondary long press functionality. 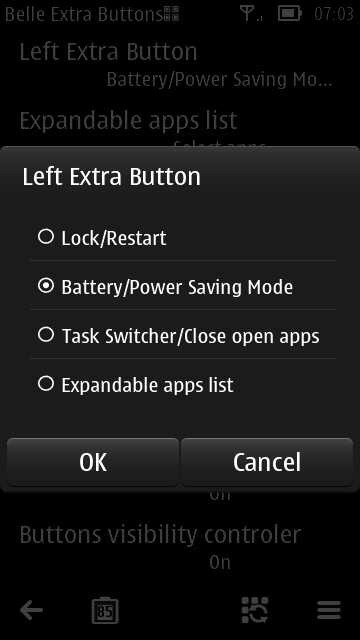 The result of these updates is that Belle Extra Buttons now provides quick access to Lock, Restart, check battery level, toggle power saving mode on/off, access the Task Manager and close all apps along with the newly added apps lists. After playing with the app in it’s latest incarnation the main issue I identified was that the apps cannot be re-organised in the “Expandable Apps List” which I have been advised will be incorporated in the next update. Other possible improvements would be linking into the OS and enabling 1-click create e-mail, message, calendar event, etc. Another suggestion would be to have a favourite contacts button akin to the “Expandable Apps List”, but for contacts. Moving more towards more blue sky thinking it would be nice if the app selection could be made easier, enabling selection from the main menu and select all from a specific folder, etc. I do have to accept, however, that this may be a limitation of the OS and development tools. We can always dream though. 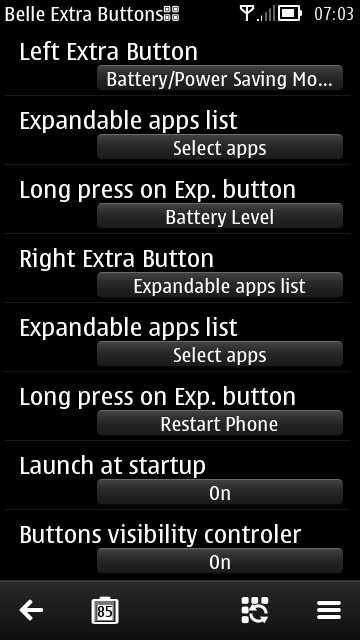 Following the updates, Belle Extra Buttons has moved closer to be a staple app on my Nokia Belle powered N8, but I get the feeling that the next update will guarantee it’s place. With a price tag of £1 in the UK and equivalent pricing across the world it certainly won’t break the back. I’ve made my improvement suggestions. Do you have any? If so let me know. I heard of this before but I thought I would leave my home screen alone. But this article presents a good argument for having the extra buttons. Especially when the web browser uses 5 buttons so well. A tad more flexibility with the button assignment and I might use it! What kind of extra functions would you like to see? Do you agree with my suggestions, or are you hoping for more/different functionality? I’ll pass you comments on to the developer. Hello! 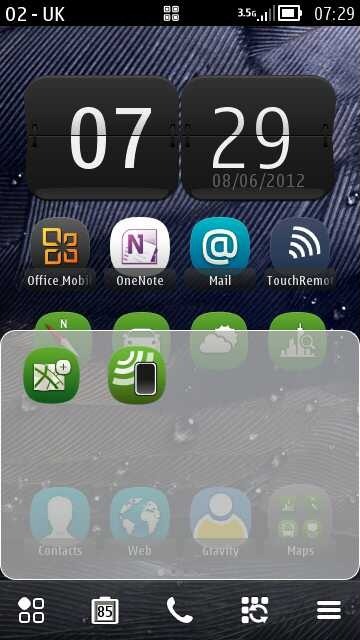 Belle Extra button application is very good! But not enough hotkeys. This situation has entered a password to lock the screen, and then forgot it, and I can neither how to unlock the screen. A hot key function would help. For example, for a program that would be when you press the buttons (power) + (Volume-) + (home), he would be unblocked and removed the default password. If you can please give this to the developer. I will be very grateful to you. And if that one-you, too, will help you. Thank you!